Trigun: Badlands Rumble Movie Information! Your source for information about the Trigun: Badlands Rumble! All of the artwork and scans here are copyrighted by their respective owners, I hold no rights to any of these and will respectfully take any images down per the owner's request. 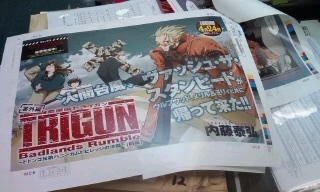 Thanks to Nash the Stampede, we now have release dates for the Trigun Badlands Rumble in DVD/BD....In Japan. Okay, so don't get too excited because we still don't have an English release date from Funimation, but the swag in Japan is pretty cool. 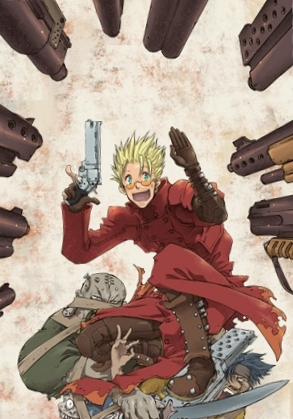 Anime News Network - Trigun Film to Bundle Dodongo Brothers Manga is where you can find the information we have up to date. It also looks like, (though I haven't translated to find out if it indeed so) according to the official movie website that this little gem of an illustration will be included somewhere as either part of the packaging or as it's own seperate extra. Nash has told me he has yet to find a store that will sell these Region 2 discs to Region 1 people, but I'm sure when the information comes available we'll have it here! ^_^ In the meantime, enjoy this pretty piece of artwork! A couple of new photos from the Young King Ours website - apparently the May issue will have some Trigun in it (I guess I should look into ordering it then? ^_^) and another from the editors note...I'm thinking it's a full-color insert ad for the movie inside the YKO. Cool beans. Check out the brand new version of "H.T." with this YouTube trailer!! One of the coolest, but most overlooked bits on the Trigun movie website are the Staff Blogs. Check it out and you'll see pictures from AnimeExpo, and AnimeAccess (not sure if I'm reading that right) but it's pretty neat seeing Nightow hanging out with American fans. 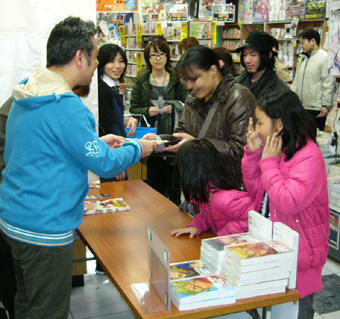 And then on the next page see just as many Japanese fans hovering around to get autographed copies of his manga (hmmm...notice how many girls!)! I had to save this photo of Nightow looking at a Stungun a Milly brought (well, obviously the stunguns are close to my own heart!) and also because it was a pretty good one, and since it must be an american fan - I'm wondering if you're out there, mystery Milly! There's also a new Trailer online that you can check out the voices of the actors - *swoons* And if you hadn't heard already - Sakuracon is going to be hosting the World Premiere of the movie all three days of that weekend! It's here! A Trigun Movie Website!! 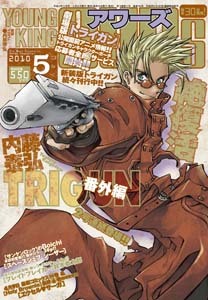 Here it is folks - the first movie trailer of Trigun the Movie 2009!! 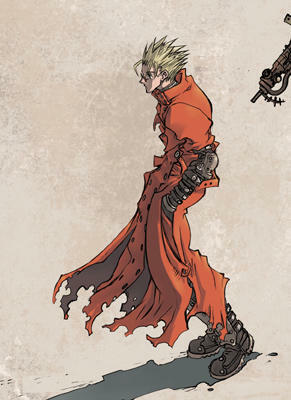 If you can't see the YouTube embed, please go here: YouTube Trigun Trailer. 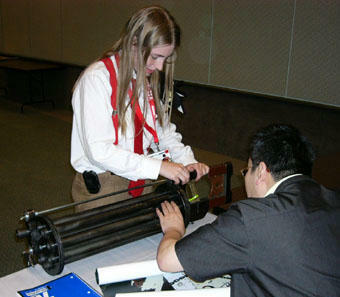 Here's the report from Edward Elric: Trinut Forum link Thanks Edward! This is awesome!!! 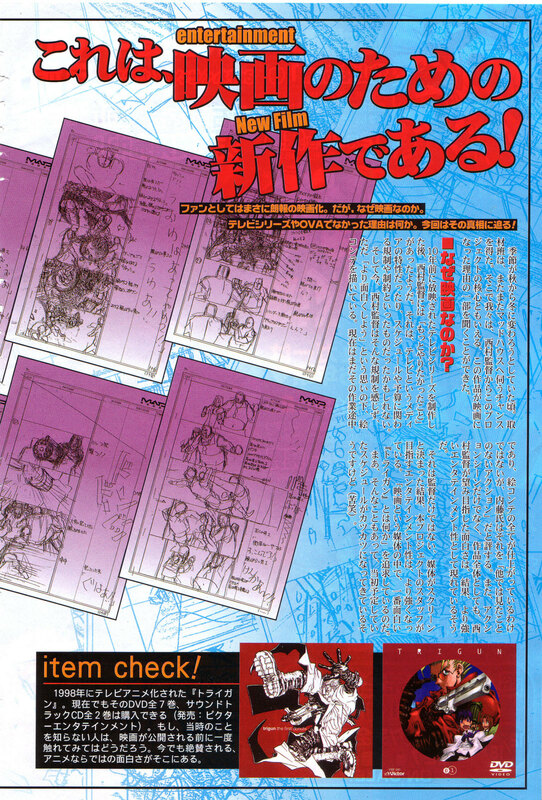 Thanks to Nash the Stampede's bugging of a friend who knows Japanese, we now have a rough translation of these pages! Whoot! Thank you! We were given special permission to see the part of the story board for the movie. There, unlike the previous TV size(3:4), we saw a rough draft that takes a wider and bigger screen into account. From Milly�s stungun to even the smallest bullets were drawn into this story board. 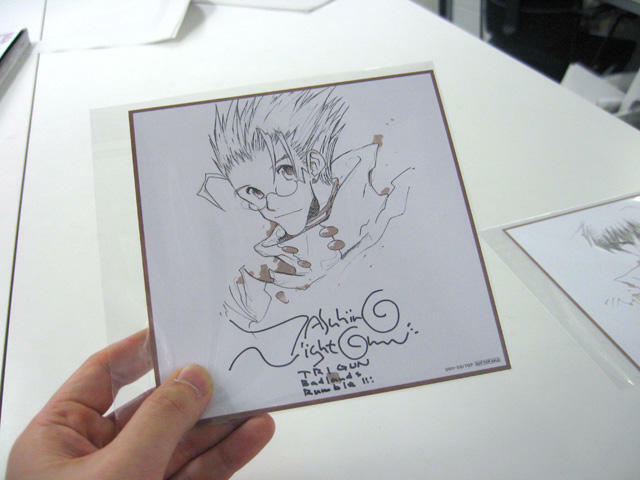 Many fans are sure to be excited by just this, [trigun]�s appeal. 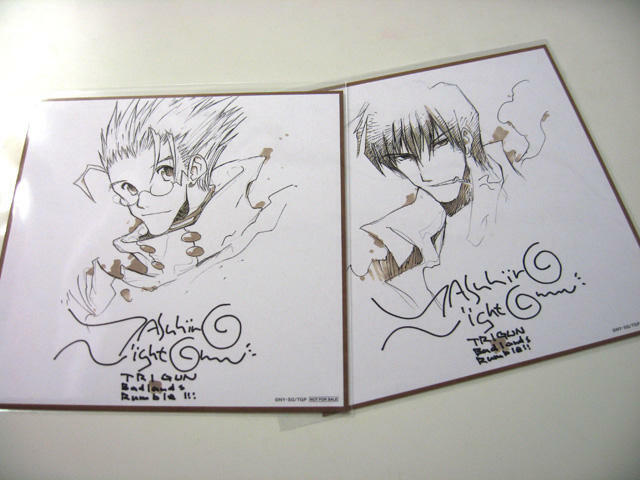 �Trigun� 2 volumes, and �Trigun maxim� 14 volumes, as an original manga became 2 seasons of a TV anime. But this time it�s a movie. Despite the screen being bigger, the show time is limited. As an anime made from a manga, they need to simplify the story to make it fit into one movie. If the producers asks for too much in that short amount of time, not only the story but even the characters and their appeal will be lost. But Nishimura is not worried. 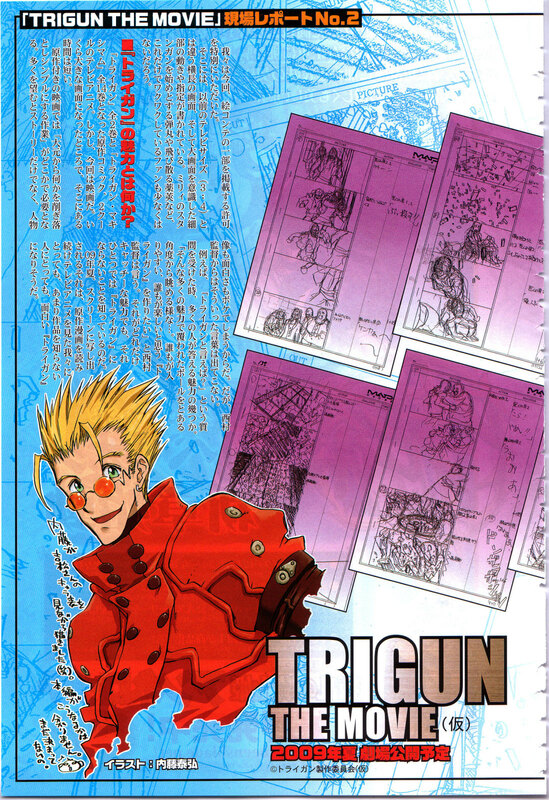 When one is asked �what is �Trigun��. There are many different answers. ��as if one is staring at a ball of all �Trigun��s appeal from many different directions� where anyone and everyone can enjoy, that�s what I hope to make.� Said Nishimura. 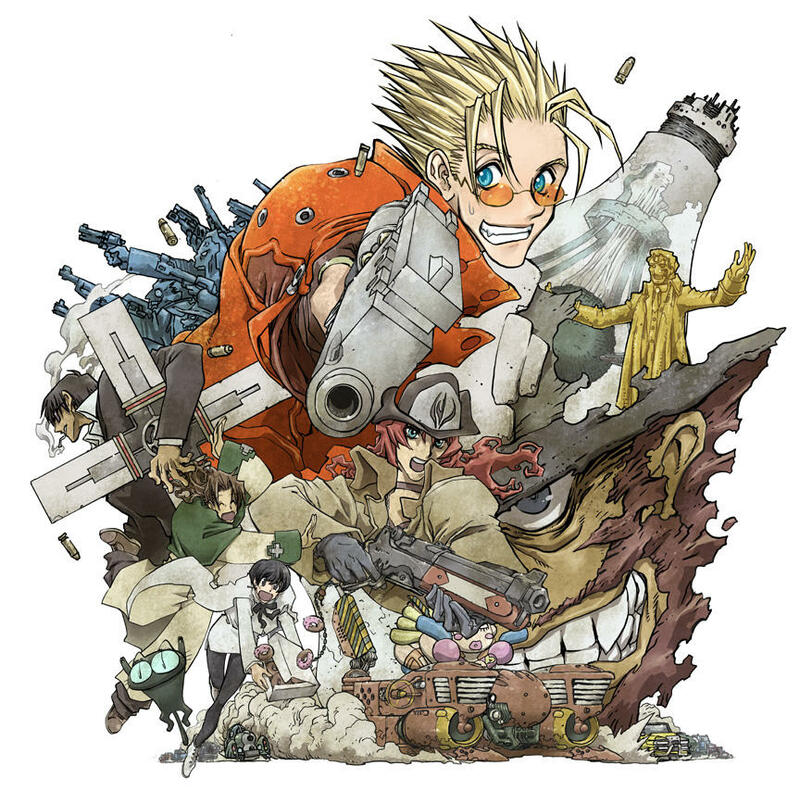 Summer of 09, a �Trigun� played on the screen will be equally enjoyable to people like us, who�ve read all the manga and seen all of the anime, as well as people who don�t know Trigun so well. When the season was turning from fall to winter, our reporters were able to visit Madhouse(production co). There, we were able to interview Director Nishimura about the reason as to why this project became a movie. Why a Movie? After directing the TV series 10 years ago, Director Nishimura wanted to do more. But due to schedule and budget issues along with the limitation of TV, it did not make it to the TV series. 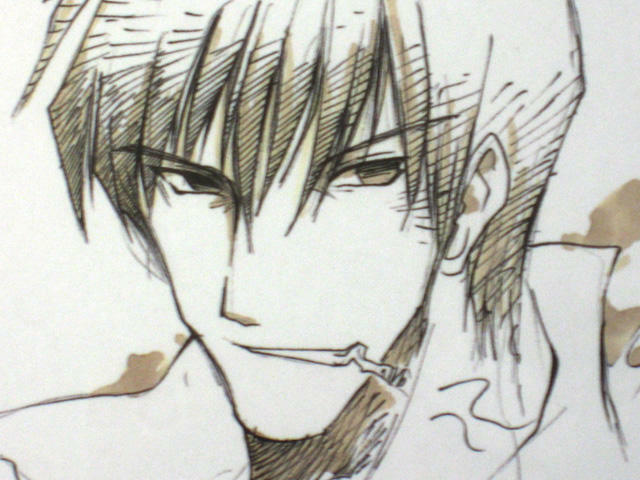 But now, with director Nishimura, not limited by anything, is drawing the storyboard. He is still in process of finishing the storyboard, but Nightow, (also interviewed) said �there is action never seen before." Not only the action but as an overall piece. The �enjoyment� director Nishimura hoped for has, as a result brought stronger entertainment to the movie. Not only the director but also the staff members� goal to produce an entertaining piece has made everyone believe that they will make the �best �Trigun� movie�. But trying to achieve this goal has made our schedule very packed (smile).